Please join the Pride Law Fund on June 1, 2013 from 5:30 to 7:30 PM for the Second Annual Pride Law Fund Bay Cruise. 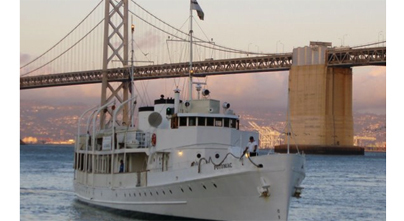 Spend the evening with friends, colleagues aboard the USS Potomac. Also known as the "Floating White House," of President Franklin Delano Roosevelt. We will be tasting wine, enjoying scrumptious hors d'oeuvres and live music. All proceeds will benefit the important work of Pride Law Fund. Early bird tickets available now. Click here! All Aboard!!! Pride Law Fund promotes the legal rights of the lesbian, gay, bisexual, and transgender community, and people living with HIV and AIDS, by funding legal services and projects and by sponsoring education and outreach. Pride Law Fund has assisted innovative academic programs, supported the development and distribution of legal and educational materials, and financed independent and documentary film projects to educate the public.